The Halti Walking All-in-One Dog Lead is a strong and durable lead that provides dog owners with great versatility and comfort. Designed to be multi-functional, the lead can be used as a hand-held lead, extended to be used as a belt for hands-free walking, or used as a tie-out tether when your dog needs to be secured out and about. A soft neoprene handle will stop the lead digging in or rubbing uncomfortably when your dog pulls, and a super-strong elastic shock absorber at the base of the lead helps protect from any sudden jolts. 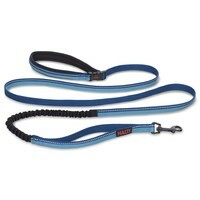 The Halti Lead also features 3M reflective strips along its entire length to increase visibility, and a strong metal trigger hook in a black finish that will fasten easily to your dog’s collar or harness.